All transactions are safe and secure with a reliable history in online purchasing behind each of our associates. 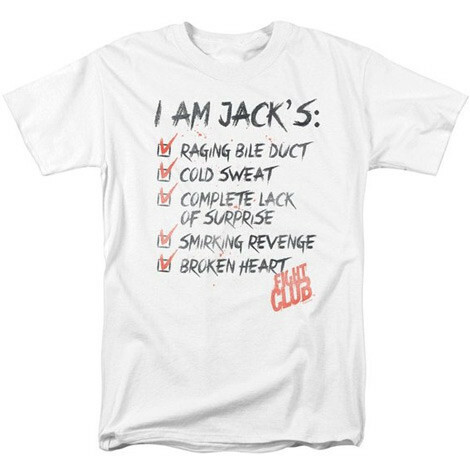 Buy the Fight Club I Am Jack's t-shirt to own Fight Club clothing and merchandise. Modeled after the series of articles Jack reads that were written about the first person perspective of a body part, this Fight Club shirt is a nod to those articles. Fellow fans may even begin to wonder if you work for Tyler Durden as a door-to-door soap salesman. Pair it with a Fight Club soap bar iPhone case, which also makes for a great conversation piece. It might not wash away you're own mischief and mayhem, but it looks great protecting your iPhone. They're perfect for fans of the movie and Chuck Palahniuk's books. In addition to the Fight Club I Am Jack's tee above, browse the Fight Club Clothing Gallery for more apparel like men's and women's clothes, kids shirts or hoodies.